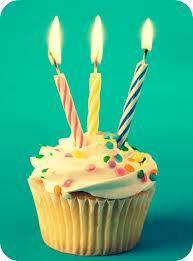 Happy Third Birthday, Waltzing More Than Matilda! The blog’s birthday sneaked up on me this year, and I only realised it turned three on February 13 today. Then I realised it was February 13 today! Then I realised it’s Valentine’s Day tomorrow, and I’m not prepared for that either! Another year seems to have just flown by, and I think it has been one of happy blogging for me. An interesting new development is that names which are featured on the blog now have a poll attached to them, and so do celebrity baby names, and some other articles too. You can also nominate and vote on your favourite names from the birth announcements. As a result, we were able to find out which were people’s favourite names, and in some cases this will affect which names are covered in the future. One of the most exciting things was the release of my first e-book, International Names for Australian Parents. Writing it was a very steep learning curve, and I’m now working on a longer book that’s slightly more daring. What Was Popular on the Blog Last Year? The most popular article I wrote was Upper Class Baby Names – there have been thousands of searches for this topic since it was published. I felt a bit uncomfortable about writing it, as it is a rather politically incorrect topic, but parents must feel a lot of status anxiety in regard to baby names. The most popular celebrity baby article was for motivational speaker Nick Vujicic, and his American wife Kanae Miyahara, who welcomed a son named Kiyoshi James. The article was cited on the Italian language version of Wikipedia, which brought in more views. The most popular photo that people clicked on was one of Nick holding Kiyoshi, and the most popular news article clicked on was to a news story about Kiyoshi’s birth. Nick has legions of fans around the world, and many of them wanted to see his wife and baby, and wish him well. The most popular document clicked on was the complete name data from Victora for 2012. A fantastic resource, and many thanks to Brooke from Baby Name Pondering for making it available. The most popular searches for individual names were for Bambam and Asher. Interestingly, Asher was overwhelmingly searched for as a girl’s name rather than a boy’s. I got my highest amount of views ever on December 2 last year, when thousands of people wanted to read all about James and Erica Packer. This was because James and Erica separated, and James was rumoured to be dating model Miranda Kerr, also recently separated from her spouse. The month I got my highest number of views was May. Popular articles from this month included Asher and Hamish, and Finding Baby Names to Match Your Surname. The busiest day for commenting was October 25, which was when birth announcement Endellion and Florabella was published, with 12 comments. The most common time people leave comments on my blog is 6 pm – perhaps because I often post around then. Nameberry was the most popular blog on my Blog Roll. Baby Name Pondering was the most popular Australian blog on my Blog Roll, and was #3 overall, only 3 views behind Appellation Mountain. Nice work Brooke! I have nearly 900 000 views at present. I have just over 1000 posts, in 24 categories and with 904 tags. I’m not really sure how many names I’ve featured, as I’m currently re-organising them, but I estimate it’s over 800. I’ve tried to make it even between the genders, but apart from all the unisex names confusing matters, I think girls might be ahead at this stage. Thank to Pam and Linda at Nameberry for giving me the opportunity to write for Berryjuice on Nameberry. Most of my referrals this year have come from Nameberry – and that means a thank you to Abby as well, because some of them were from her Nameberry Nine series. Thank you to Kate for inviting me to write an article for Matilda magazine. Called Beyond Liv and Zeke, it looked at some of the less common one syllable names for boys and girls. Thank to Sophia, who was my busiest commenter. Sophia’s comments are thoughtful and humorous, and it’s a pleasure to hear from someone who is so candid without being unkind. And of course thank you to YOU – all of you! Thank you to every reader, commenter, poll voter, subscriber, name consultation requester, Twitter follower, Facebook liker, blog roller, book buyer, and everyone who has made a contribution to Waltzing More Than Matilda in some way. It just wouldn’t happen without you, and you’ve helped make Waltzing More Than Matilda’s year. Congratulations, Anna! Many happy returns to Waltzing. Long may she reign! Happy Birthday!!! Congratulations on reaching a great milestone. Happy blog birthday, and many happy returns! I’m in awe of what a fantastic year you’ve had! Happy birthday – wishing you great things for the year ahead too (and thanks for the shout out ☺)! !